When I met my brother-in -law to be for the first time, the instant connect and camaraderie between the four of us, my husband, my self and my sister and brother in law made me feel happy, no doubt. But, little did I know at that time that my brother in law would go on to be a real brother to me later on in life. His good persona, childlike enthusiasm, vast knowledge and intelligence and the deep laughter that all of us at home have come to associate with him makes sure he wins over people easily. Mihir comes from a traditional Tamil Brahmin family. Like any other Tambrahm, he loves his native cuisine and my sister hailing from a Kannadiga Brahmin family having ventured into the territory of cooking Tambrahm food means he is not deprived of the same. I always knew about M’s passion for Italian and French food due to his strong French connect, being an alumni of INSEAD in France. But, what I wasnt aware of was his love for Mexican cuisine which came as a surprise to me. And this revelation came to me, when my little Hari and me were spending a part of Hari’s annual vacation with my sister and brother in law a few days ago. On one of my shopping excursions, I happened to pick up an avocado on a whim and when I put it on the tray with the intention of allowing it to ripen, out came the request for guacamole and some Mexican food with profuse claims of his love for the cuisine. 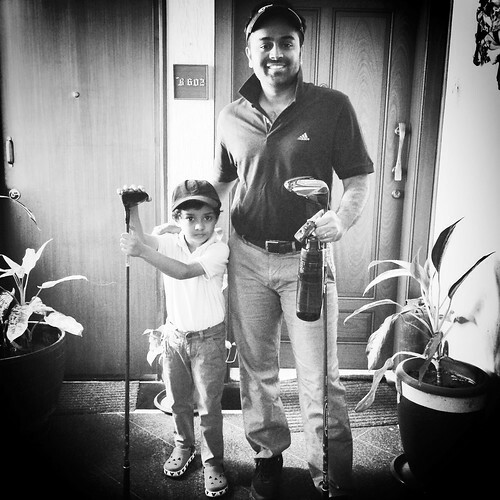 Mihir also happens to be an avid golfer and the one responsible for getting Hari curious about the game. 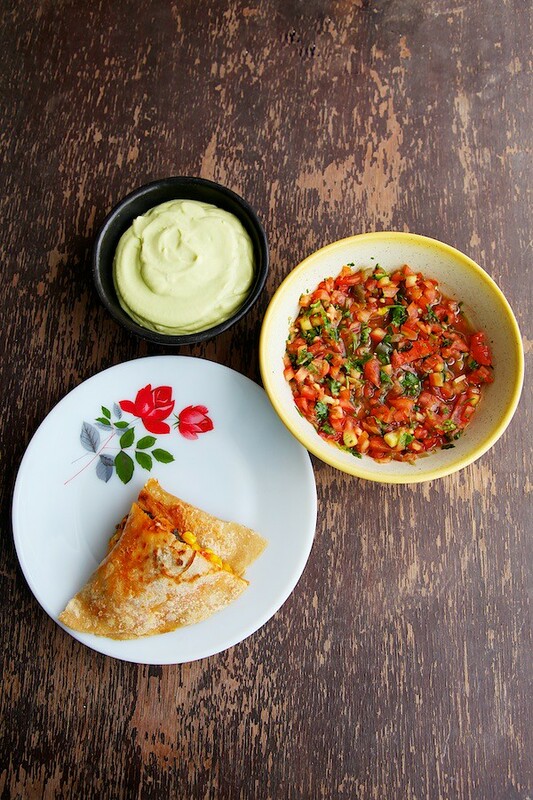 It used to be a joy to watch my little one march off to the golf fields with his chithappa and on one such day when they returned I treated them with some Mexican fare – My Smoky Vegetable Quesadillas, Fresh Tomato Salsa and ofcourse the Guacamole. Mexican cuisine has a lot of Spanish influence and in Spanish “Queso” mean cheese and that’s where the term “quesadillas” is supposed to have been derived from. And anything to do with cheese is also supposed to be a treat for my cheese loving son so the quesadilla got a thumbs up from Hari as well! 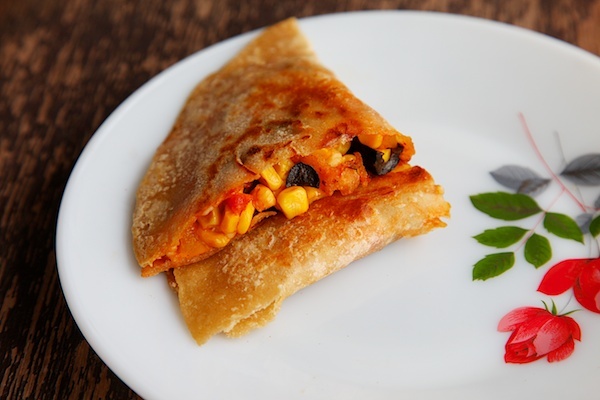 The yellow golden corn, bright red tomatoes, black olives and bell peppers mixed with cheese and smoked paprika are a beautiful medley of colours and when stuffed into tortillas are delightful and delicious as a snack, part of the main course or for a kiddie lunchbox. 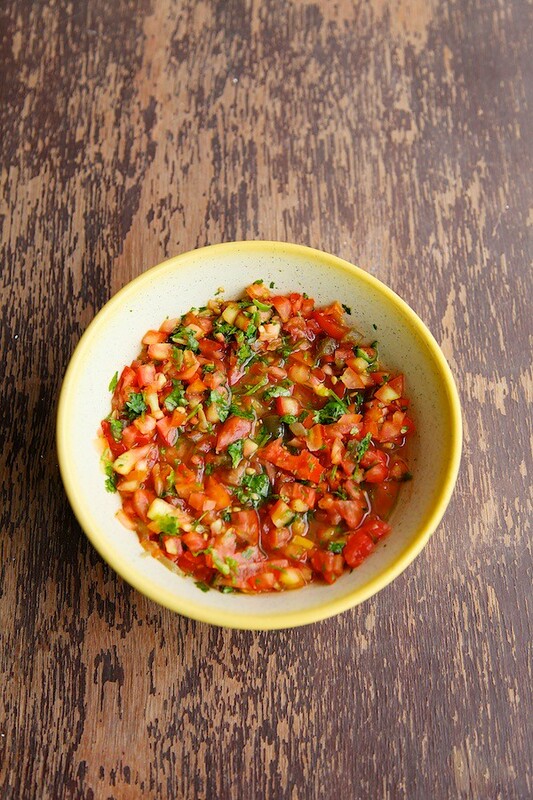 Salsas are extremely popular in Mexican cuisine and my fresh tomato salsa is a breeze to make. The chili, jalapeno and black pepper give it a spicy kick which is balanced with the sprinkling of some lime juice. 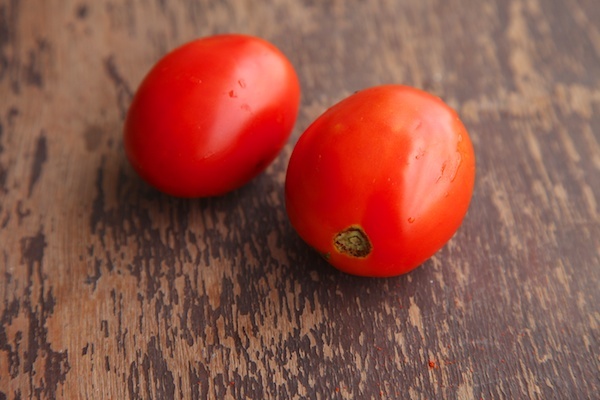 Whenever I sprinkle some lime juice over the tomatoes for the salsa I’m always reminded of my neighbours grandmother who ate juicy red tomatoes with a sprinkling of lime juice, salt and pepper. And the story still circulates amongst friends about how everyone’s mouth used to water seeing her eat this combination. And now coming to my favourite part- the guacamole. It is important to ensure that the avocado is fully ripe. 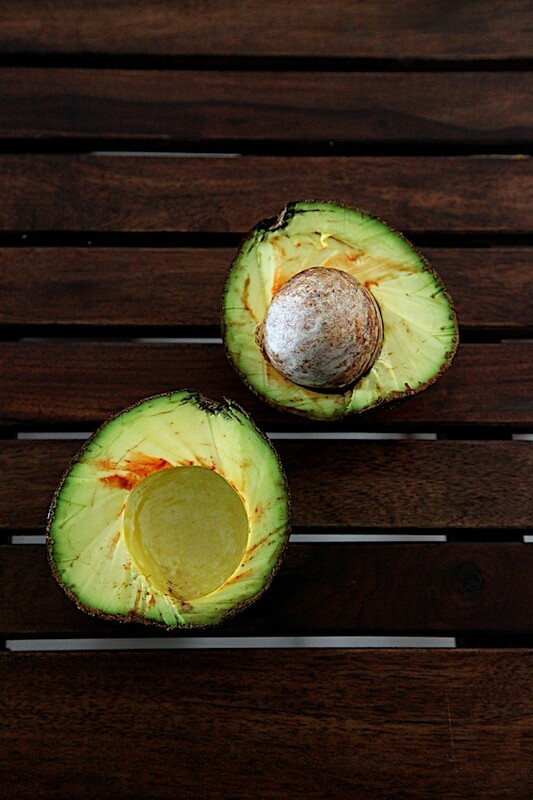 The skin of the avocado has to be smooth and if the surface is hard, it means that the fruit inside is not ripe. 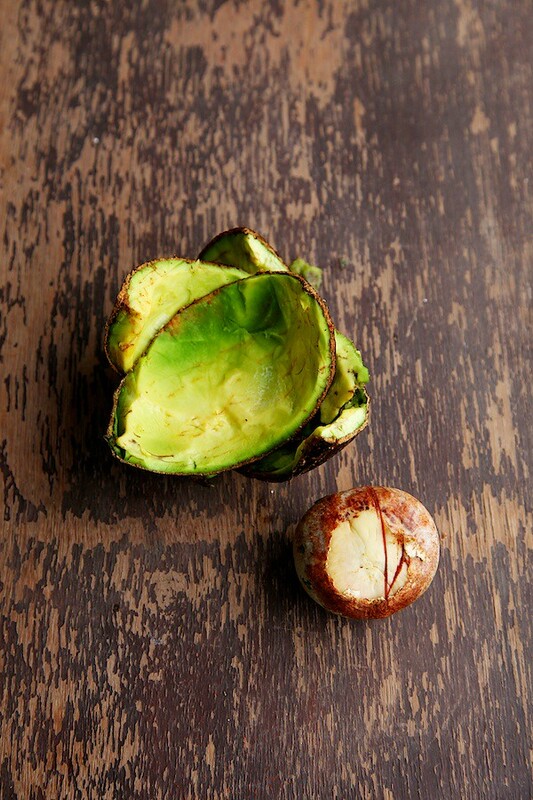 Unripe avocados can be quite bitter and unpleasant and can prove to be a spoil sport in a guacamole so it is best to wait for an avocado to ripen or to buy a ripe avocado. When I have a crowd to feed, what I do is I make a large batch of this guacamole and divide it into 3 batches. I place some tortilla chips around the bowl of guacamole. And let me tell you everybody loves the crunchiness of these chips with the smooth butteriness of the guacamole.Then I surround the next portion of the buttery goodness with some celery sticks, cucumber sticks and carrot sticks. This is a combination of taste and health. Into the last portion I mix in some cooked kidney beans, boiled corn and one chopped tomato. And to make this a complete meal, I spread the guacamole over a tortilla or roti, top it up with boiled corn, kidney beans and my favourite vegetables and roll it up to savour the delight in every mouthful. It is amazing how good food can spread so much happiness and cheer and by the end of it all, I had a very happy family. It is always satisfying to see the twinkle in the eyes of people who have savoured a good meal cooked by yourself and this was just a small gesture on my part for a brother in law who turned out to be my brother from another mother. I like to use Indian rotis which are very similar to tortillas for the wrap. You can do a mix of whole wheat flour, maize flour or plain flour or even use 100% whole wheat flour to make the tortillas or the rotis. Pre heat the oven at 200C/400F. 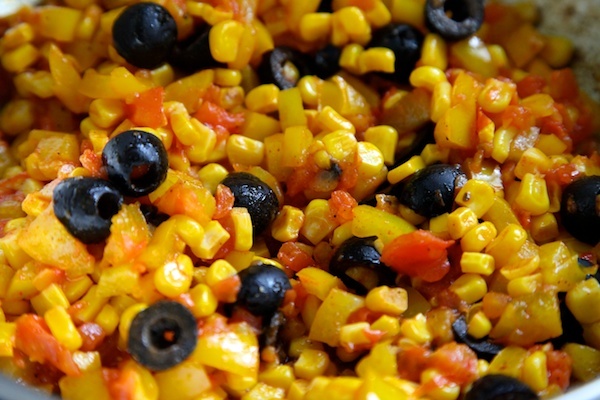 In a baking tray, put in the vegetables, bell pepper, tomatoes, olives and corn. Put in salt, pepper and paprika. Drizzle with olive oil and toss well. Put in the oven for 10 to 12 minutes. After the vegetables are out of the oven, allow to cool down for a few minutes. Heat a frying pan over medium heat. Mix the vegetables with the cheese. Divide the stuffing into 4 equal portions. Take a tortilla and place a portion of the mixture over one half of the tortilla. Fold the tortilla covering the mixture into a half moon shape. Place this on the moderately hot pan and smear a little oil over the tortilla.Press the tortilla slightly for a few seconds and allow the cheese to melt.Flip the quesadilla to the other side and smear some oil over it. Cook until nice brown spots appear and the quesadilla is slightly crisp. Take care of the heat source for the pan so as to not to blacken the tortilla. Cut into triangles. Serve with lettuce, salsa, sour cream or guacamole. *Use only one bell pepper if the bell pepper is big. Method: Mix all the above ingredients and make into dough. Divide into 4 parts. On a floured, clean surface roll into a circle. Lightly cook on a griddle or in a frying pan and use as required. 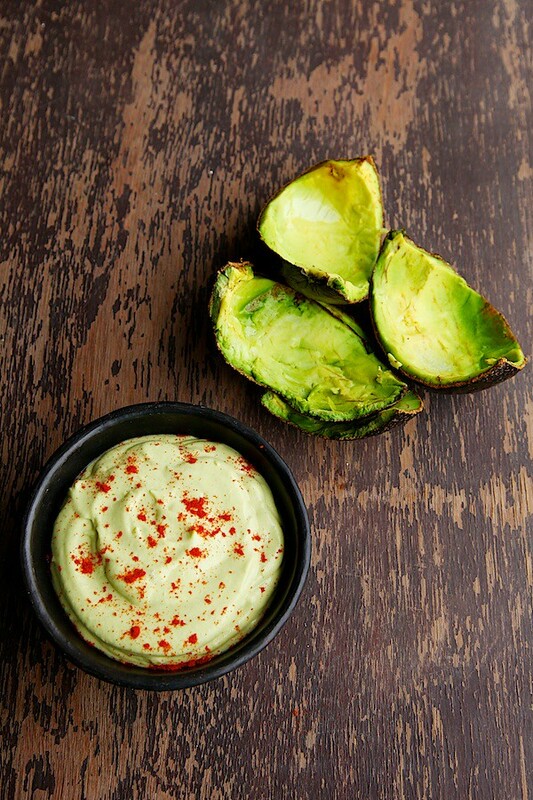 Serve guacamole with your favourite veggies or tortilla chips. Cut, the avocado lengthwise, deseed and scoop out the flesh. Mash a little. Put in the jalapeno, sour cream, salt and pepper and mix well. In a bowl, put in all the ingredients, tomatoes, green chili, jalapeno, fresh coriander and mix well. Stir in salt, pepper and lime juice. Mix well. Thanks a lot, Anu. The food was delicious. Can't wait to taste more Mexican delights from your kitchen! There is something really rustic and comforting about the Mexican cuisine that I really love. Was a lovely read. Anushruti , commenting after a long time but I visit your site almost on a daily basis. I think this is one of my favorite posts of yours:). I love the way you described the background to this dish. My husband loves Mexican food too and I am planning to make this as a surprise to him with this Your recipes have never ever failed me so I am hoping to have one very happy husband this weekend. P.S – Your little Hari is so adorable, that picture of him with Mihir is priceless. I just happened stumble upon you site last weeks and have tried many of your recipes. Your eggless orange cake was an instant hit and have already baked it twice. There are several reasons why I like your site, few being, we are also from Hubli-Dharwad, eat only satvik food, do not like to use nonstick cookware or microwave oven etc. First of all, where were you all these days? I missed you and as well as your lovely posts. Please dont give such a long breaks kano…. I am not used to continental foods, because at Mysore we dont get all these ingredients. Not even tasted these things.. But Love all your posts…. Shilps: Welcome to divinetaste! Nice to know about your food preferences. Look forward to hearing more from you. Roopa: How sweet is that! I'm overwhelmed with what you wrote! Unfortunately I was involved in a project that kept me away from here. I will post more often now. I will ofcourse post all kinds of cuisine here. Do keep writing! It is inspiring! very nice recipe and photos. Thanks for sharing. 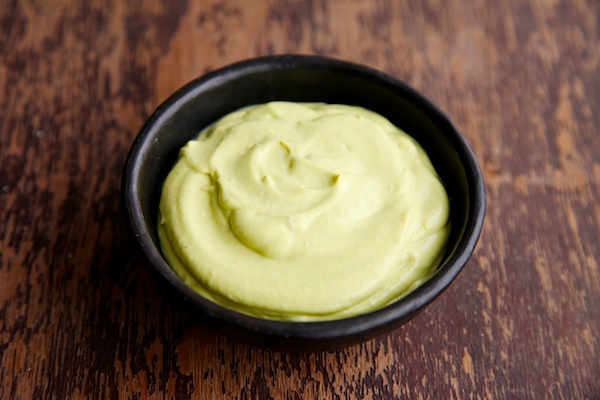 You have great recipies but I have to correct you on something – sour cream and avocado mixed together is not called guacomole. Pam: Thank you. If you do some research you will find that many regions in Mexico do use sour cream in guacamole. 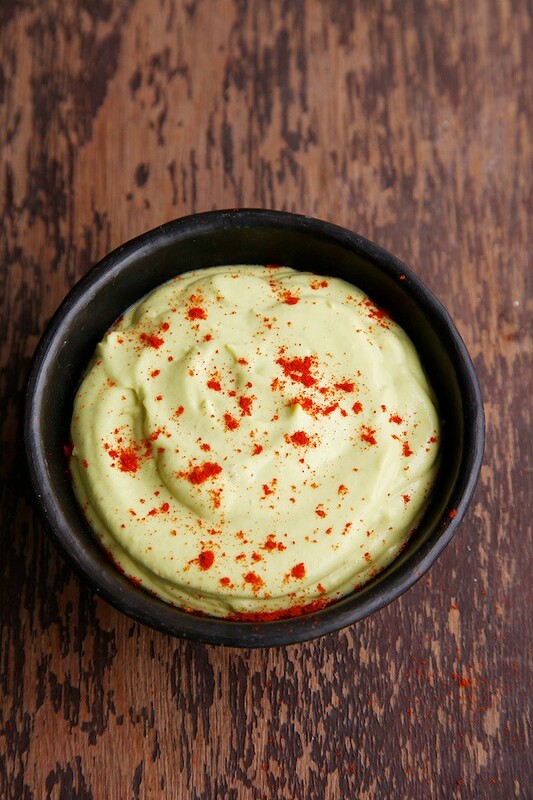 When one doesnt have access to great quality avocados, sour cream can do a lot in this dip.